Car seats can be installed using two different methods – the vehicle seat belt or LATCH, which stands for Lower Anchors and Tethers for Children. Many parents wonder which option is the safest for their baby or toddler. 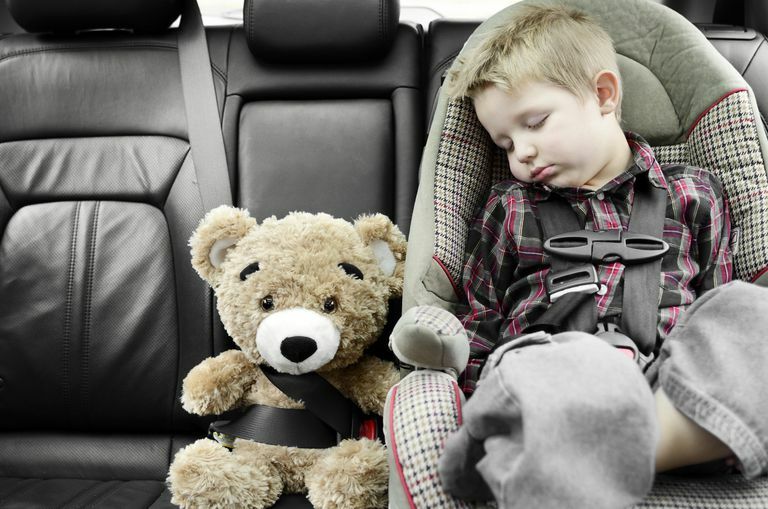 Both LATCH and the seat belt are equally safe in general, but whether one is safer than the other depends entirely on your child, your vehicle, and you. One installation method should be carefully chosen for your baby's seat, though. It isn't safe to use both LATCH and the seatbelt to install a car seat. The vehicle seatbelt can always be used in the traditional way, where it is routed through the belt paths of the car seat and buckled in. The seatbelt itself is locked and tightened, or a built-in lock off on the car seat is engaged to hold the car seat in place tightly. The advantage of seat belt installation is that the seat belts are fairly easy to locate in any vehicle. Once you’ve practiced installing the car seat in one vehicle, it’s pretty simple most of the time to move it to another vehicle since you already know which belt paths to use and how to engage any lock offs. You can also install the car seat in vehicles that are older and do not have anchors for the LATCH system. You can install the car seat in just about any vehicle position except the driver’s seat, as well, since you aren’t limited to positions with lower anchors. If your child is still riding rear-facing, you cannot install the car seat in front of an active frontal airbag. Another possible advantage for seatbelt installation is the ease of use of some newer car seat lock offs. Some car seats have locking mechanisms that clamp and tighten the seatbelt with very little effort on your part. One example is the Britax Marathon Click Tight car seat. You open a piece of the car seat like a trunk lid, thread the seatbelt through, then close the trunk-type piece for a tight installation. It's incredibly simple. Even if you're fairly familiar with various seat belt systems and how they can be used to install a car seat, you should check the vehicle owner's manual. It will tell you how to lock the seat belt if necessary and will give any important installation details specific to your vehicle. LATCH installation has been available for more than 15 years now, and it has multiple components. In the vehicle, there are sets of lower anchors that look like metal loops. These are sometimes recessed into the bight or crack of the vehicle seat, or sometimes they stick out from the seat. Many vehicles have two sets of lower anchors, one on each back seat outboard position. A few vehicles may have sets of lower anchors in all three backseat positions. In vehicles with a third row of seating, the lower anchor sets may be spaced out between the middle and third rows. There will be a tag, button, or imprinted lower anchor symbol to tell you where the lower anchors are in the vehicle. Even if you can easily locate those lower anchors, you should still read through the LATCH section of your vehicle owner's manual. It will give you installation advice specific to your vehicle. The tether anchor is the second part of the LATCH system in your vehicle. It looks like the lower anchors, but there's only one and it is typically positioned on the back of the vehicle seat, though many vehicles have the tether anchor on the floor behind the seat for which it is intended. Some vehicles, most often SUVs, have a tether anchor on the ceiling above and behind the back seat. The vehicle owner's manual can give you the exact location of any tether anchors in your vehicle. There will be a tether anchor to go along with each set of lower anchors, and there may be additional tether anchors, as well, that can be used along with a seat belt installation. For pickup trucks, the tether anchors may look vastly different than in other vehicles. They may even be loops of webbing instead of metal. You must read the vehicle owner's manual to learn how to use this type of tether anchor. It is one of the only types where more than one car seat could share an anchor. The third piece of the LATCH system is on the car seat itself. There will be a single webbing strap, or a strap attached to each side of the car seat, with connectors that hook to the vehicle lower anchors. Some car seats have a rigid attachment system instead of the webbing. This consists of fixed pieces that stick out from the car seat and are simply clicked onto the lower anchors in the vehicle. The car seat, as it can be used forward-facing, will also have a top tether. At the end of the tether is a connector that hooks to the tether anchor in the vehicle. The main advantage of the LATCH system is ease of use. It was designed not to be safer than a seat belt, but to simplify car seat installation so parents didn't need to learn about locking so many different types of seat belts. For some car seats, rear-facing car seats in particular, another advantage of installation with the lower anchors is that the car seat is less likely to tilt to the side due to pressure from the shoulder portion of the vehicle's seat belt. Other car seats offer amazing ease of installation with LATCH. Consult the car seat instruction manual for information on the specific LATCH pieces on your car seat, including how to route the webbing belt if it is a convertible car seat that can be used rear- and forward-facing. The car seat labels on the side will also give some basic directions on LATCH usage. Which is safer for my baby? It all comes down to which installation method works best in your vehicle and which one you can use easily and correctly each time. If you want to install the car seat in a rear center position, that may require using the seat belt. Most vehicles do not have a set of lower anchors dedicated to the middle seat, and most do not allow the use of the inner outboard anchors from either side for installation in the center. Check the vehicle owner's manual to see if this is allowed. You'll also need to consult the car seat owner's manual since the center seat spacing may be non-standard and may not work with the car seat's connectors. You may have heard that the center seat is the safest, which is true, statistically. If it is easiest for you to install your baby's car seat correctly with LATCH, it is perfectly acceptable to use one of the outboard seating positions to do so when LATCH is not available in the center or doesn't work well for you there. If the vehicle manufacturer put lower anchors and tethers in the outboard spots, they clearly intended for children to ride there, and the vehicle has been tested that way. Your child's weight also affects the safety of the installation method. Car seats today are labeled with a maximum weight for installation with the lower anchors. If your child's car seat has a high weight limit, you'll probably need to switch to a seatbelt installation at some point, even if you've successfully used LATCH previously. The car seat manual will give details on when to switch between LATCH and seat belt. Before you decide how to install your child's car seat, try out all of the possible seating positions with the seat belt and with LATCH, if it's available. Get guidance from the vehicle owner's manual and the car seat instruction book. Ask a certified child passenger safety technician if you need additional help. Bottom line -the safest installation method is the one that is easiest for you to use correctly every time your baby is in the car. Is It Safe to Install a Car Seat in the Center Using LATCh? Is It Safe to Re-Use Baby's Car Seat After a Crash?